Education transformation - everyone is doing it! Now in San Diego for the Annual CEFPI conference. It is always great to meet up with old colleagues, network with new ones, and have a chance to catch up with what people are doing from other parts of the world. I spent time last night over dinner with old friends Randy and Kris Fielding from Fielding Nair International and some great people from different aspects of education in Regina, Saskatchewan in Canada. It was really interesting to hear the various (but often similar challenges) from building new schools (and funding issues), trying to transform education, (especially regarding learning and teaching) down to the issues of running a school with a non graduation rate of up to 80%, largely due to a highly transient population. Some of their current plans are very ambitious and cutting edge, especially in their discussions about where really education should take place for maximum impact on students but also for the community and life long learning. Typically challenging and innovative ideas from FNI are adding great interest to the debate. Does it really have to be all based in one building we call a school? Of course not! The fascination is what replaces it and the ingenuity of the solutions being considered! What is really encouraging that so many people are trying to do so much that is similar, often with the same issues. Conferences such as this are a great way to learn, discuss and build learning and working partnerships. 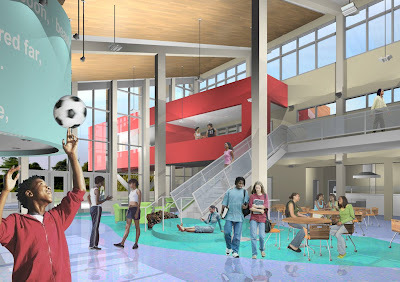 21st century learning spaces - rising from the ground! It is really incredibly exciting to receive news updates on the progress of the fantastic cutting edge designs of new schools in Grand Cayman. Having been involved in this project from the very start, it is just fantastic that the buildings are now 'rising from the ground', and the concept drawing and architects impressions become real. 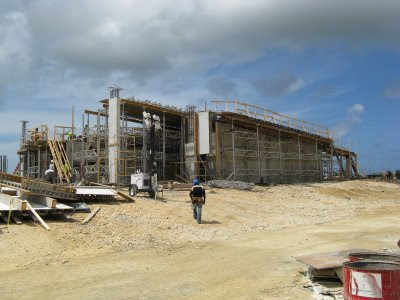 The photrograph above shows the progress in building the Global Learning Centre of the Clifton Hunter Campus based in Frank Sound. There is still massive international interest in the work that the Cayman Islands have undertaken. In my new roles, based in the UK, I am very frequently being asked about the Cayman story, from people who have heard all about it in conferences, from websites and a range of other sources. It really is interesting to see such repeated genuine interest in one small country being brave in planning the future for its education system, and continuing to be brave! Many seem to be very jealous of the ability of the Cayman Islands to have been able to do this. Listening to some people talking about one particular news story this week has been like listening to people from the dark ages. Already the doubters are tut tutting about the move towards personalising the curriculum, but the story in the media this week about the UK student who has been allowed to undertake clay pigeon shooting as part of her GCSE PE exam course, has really caused some to splutter in indignation. They are wrong in my opinion. Admittedly the debate about guns in school is rightly very controversial, but Sally Bond of Clacton High School is the top junior in the British under-21 womens clay pigeon team and is aiming for the 2012 Olympics. That makes her pretty good and implies that she works extremely hard at this sport. GCSE PE is a hard subject in which to do well in, it is not about just 'kicking a ball around'. Sally's adapted syllabus covers all the many and complex aspects of this sport, from safety to skills. She is obviously passionate about this sport and practices frequently. The more she learns the better she will become. Why shouldn't she be rewarded with some accreditation for this considerable effort, and skill? Student really do work well when they are interested and motivated in the curriculum - otherwise they just turn off. It is really pleasing to see that EdExcel have listened to the request and supported the move to personalised learning in this case. However, as we aim to move towards true personalised learning for all, it should not be news, but the absolute norm! 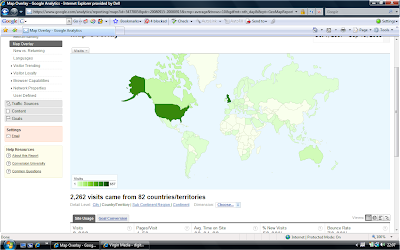 The total of countries logging into this blog keeps on increasing, to my amazement... thanks for the interest! I realise that entries have slowed recently, I put this down to the new projects I am involved in - the work is so interesting!! More effort will be made! Student voice - learning styles - Why don't we ask students and then do something about it? It is now increasingly acknowledged that many students claim to ‘learn’ more outside of the school environment than inside it. For many, what happens in schools does not engage or excite them and the relevance for them is, at best, dubious. As I get more and more immersed in the BSF (Building Schools of the Future) programme in the UK, I am still really almost shocked as to how little exploration there is, and subsequent credence given to, the students input regarding the learning experience they wish to have, even now, not just in future exciting new environments. Equally, who has asked them how they would like teaching and learning to change now and in the future? In fairness, many students in areas considering new or refurbished buildings have had input into environments, as regards designs, colours, areas and types of spaces they like. They have cut up pictures from magazines, explored class room designs (but who says they want good old classrooms??) and discussed catering and bathrooms. Who is having those real detailed discussions with them as to what spaces they would really like to undertake what types of learning activities in? Students do know about these things. Every time I have put students in front of their own staff to discuss their best learning experiences and ways they like to learn, the staff have always been blown away by the understanding, sense, clarity and perceptiveness of their views. What WILL it look like in the future… and who is really going to help prepare the teachers on the ground for what needs to be a real change in professional practice? As I move between cities I am always looking at interesting environments… this raised small garden in Euston is interesting, unusual and eye catching, especially as the tree grows. It could be quite an interesting idea for schools providing both social gathering areas as well as shade opportunities whilst increasing greenery in crowded urban settings. I’m not sure of the intention of the architect in its design, but I am kind of sure that it was not intended as an undercover smoking area for nearby office workers when it’s raining which is what it has become. When it used like this it really is quite a weird site to see so many people all squashed under this small square all puffing away… smoke and steam emerging all around. Maybe not the healthiest environment – hope it doesn’t damage the plants through air pollution! Flexi-hours for work are increasing, working at home is increasing (with it's advantages and disadvantages), and the capacity of technology is developing faster than ever! 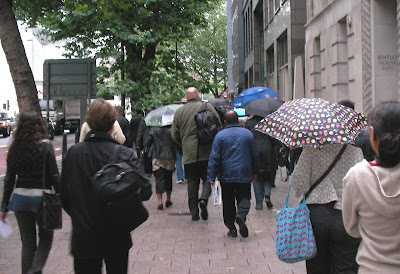 Surely there must be better and more effective ways for quite so many people to have to cram into the city all at the same time every single working day. This argument could also be extended to schools. How often have teachers asked for earlier or later starts to the day for a whole variety of reasons, personal and professional? The same surely equally applies for students, many of whom now openly admit to learning more useful information out of school than when they are in it. There are already schools trialling 'late' starts for some groups, allegedly reporting improved performance, attendance and discipline. We also have the welcomed increase in experiential learning in a variety of different locations out of the school environment. In addition with the development of VLE's (or MLE's) and the trend to students having their own handheld devices in an increasing number of areas, surely the whole organisation of education (in and out of schools) should really be being considered rather more seriously.... and creatively? Whilst sitting in a taxi in Manchester this week (in the seemingly never ending rain!!) the driver was quick to establish that I was 'somehow involved in education'. From that moment he was quick to tell me all about his 'on-line' plumbing course and how good it was and what a great way to learn. He could do it when he wanted and do the necessary reading any time, anyplace with assessments as he felt ready. He was particularly proud of his integrity in completion of the assessments - and whilst 'friends' were suggesting he looked up the answers when he got answers wrong, he had no intention of cheating himself. He was aiming to be quite the entrepreneur renting out his cab whilst busy practicing his new skills. He was a superb and honest advocate of the need for life long learning, and he could not really understand why everyone was not wanting to extend or develop new skills, especially as the "world is always flippin' changing!" It was genuinely refreshing to hear such a positive honest and upbeat advocate of both life long and on line learning - he would have been an ideal person to put in front of anyone... from adults to secondary students. He really was excited about it!